Jonathan Levin, the author of the recently released LiberiOS jailbreak for iOS 11.1.2 devices, has pushed out a new version of the jailbreak built with a slew of improvements and fixes. As expected, the release comes relatively quickly after the initial release and looks to immediately address the issues of the initial version. 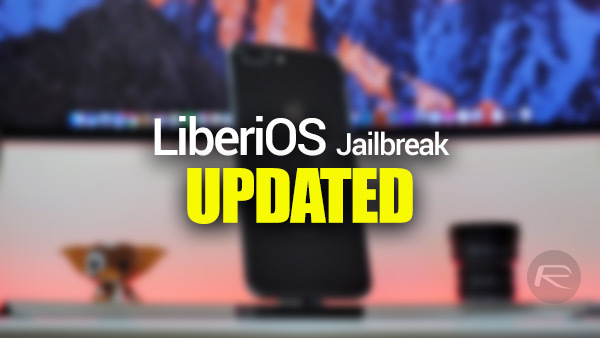 First and foremost, the latest version of the LiberiOS jailbreak adds support for all 64-bit devices running firmware version between iOS 11.0 to iOS 11.1.2 thanks to the addition of new offsets. In addition to this, this new version also incorporates a brand new UI that looks much more pleasing to the eye. And of course, stability improvements have also been added due to “proper cleanup”, which means it shouldn’t crash on you and should provide a more positive experience with less chance of failure. This latest version of LiberiOS is yet to include fully working version of Cydia Installer and Cydia Substrate though, which, as we have previously learned, is mainly down to Jay Freeman saurik to resolve and offer. And, as we also already know, saurik is already working on it. It’s just that we don’t know when will the updated bits from him will be ready for public consumption on iOS 11. In the meantime, you can of course still use LiberiOS to jailbreak your iOS 11.1.x device. Cydia and Substrate can easily be installed later whenever they are updated and ready for use on iOS 11 devices. You can grab the latest and improved version of LiberiOS from the official site here. Once downloaded, you can follow our guide here to jailbreak: Jailbreak iOS 11 / 11.1.2 Using LiberiOS, Here’s How [Tutorial]. If you are already jailbroken on 11.1.x using previous version of LiberiOS, you can simply delete the LiberiOS app from the Home screen and then reinstall the app by sideloading it using Cydia Impactor as explained in our guide linked above. I think I’m going to wait to have cydia installed at the same time I jailbreak it. Just waiting for 5 icon dock and themes. So basically i successfully jailbroken my iphone 8 plus only reason i did was to block auto update. I hope later i can install cydia from same liberios app? Or would i need to sideload the whole app again. Did you go into Xcode and revoke the previous certificate? From my understanding you can only side load 3 ipa’s with a free Apple developer account. You have reached the maximum, maybe? If anyone knows a way around 3 app limit I’d love to know. Why jailbreak, just to block auto update..?? That’s just playing dumb!! Just download/install tvOS Beta Software Profile..
Make new apple id . Unless you have a dev account then you just install it and never worry about it again. NOPE! I already had it installed and after updating to 11.1.2 even with the beta installed it tried to upgrade on me. Luckily I caught it. You just reboot then delete liberios and install it again. It’s not like old jailbreaks that do massive changes to your device. When I installed this new version of Liberios when i click on the app it gives me the screenshot shown above and not the “Do It” button from the previous Liberios. Does this mean I am good to go? Ha! Figured it out. Apparently you have to hit the ‘K’ in the word “Jailbreak” for it to actually work. Then the jailbreak word changes color and then in about 10 seconds it says it has be done. Try running the app in Landscape mode.